I just found what I’ve been doing wrong all these days: laughingthrush should be one word! I’ve seen several of them before, and thought of them as a variety of thrush, but apparently they are all classed as one separate genus, the Garrulax. We saw this Streaked Laughingthrush (Garrulax lineatus) on our aborted trip to the gates of the Great Himalayan National Park. It was quartering a ledge below the path we were on, examining the ground very closely. This behaviour clearly meant that it was an insect-eater looking for its next meal. Traditional classifications place 45 species into this genus, but recent genetic studies indicate that these birds and the babblers have to be re-classified. This causes a confusion about whether to call the bird Garrulax lineatus or Trochalopteron lineatum. No matter what biologists call it, the Streaked Laughingthrush is common across the Himalayas and can also be found in Afghanistan, Tajikistan and Uzbekistan. My first sighting of the bird was ten years ago, in Bhutan. But I should rethink that, since the Bhutanese subspecies is now said to be a separate species, the Bhutan Laughingthrush. Avibase records four subspecies. The region we were in showed a very high number of reports of this bird. Looking at the map of the reports, I wonder whether the density of sightings has to do with the number of birds or the number of watchers. It is quite possible that the bird is evenly distributed across the Himalayas. A survey in Uttarakhand found it at all altitudes they surveyed: from urbanized areas at an altitude of about 500 meters, to forests at heights of over 2 Kilometers. Studies like these lead to the IUCN’s classification of this bird as being of least concern for conservation action. 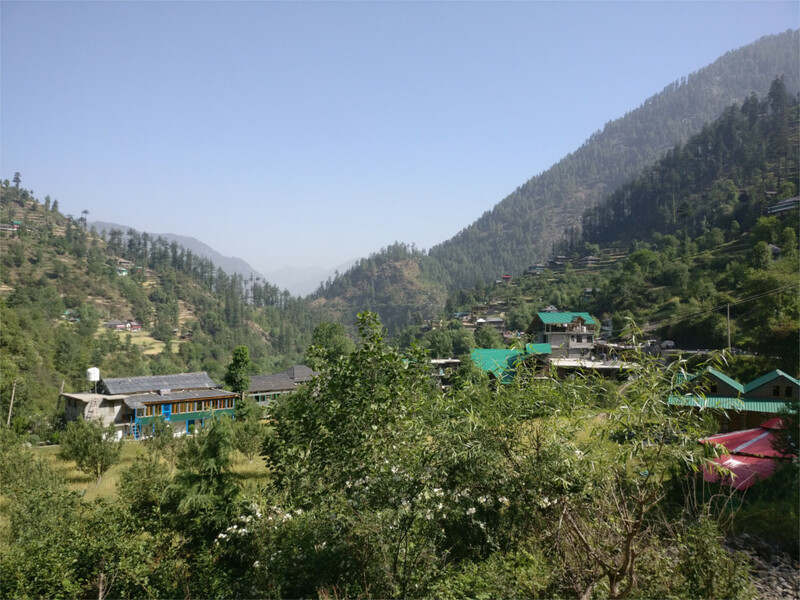 We didn’t manage to get much birding done on our aborted walk from Gushaini to the gates of the Great Himalayan National Park at Ropa. It was a bit too late in the morning, and I, for one, was too busy panting during the steep uphill sections to do much looking. So we climbed back down, on a “shortcut” which locals take. This is essentially just short of rolling downhill, until we came to a bridge under construction across the Tirthan river. We clambered across this, and climbed up to a motorable road on the other side. Why? Sanjay, our guide for the day, said that we could possibly see some birds about a kilometer higher up. By the time we decided that it was too late for birdwatching, it was midmorning. Sanjay said there was a tea shop nearby. I didn’t mind some tea, so we walked down there. The pleasant young person running the shop (featured photo) was happy to make us some. In one corner of his shop was a kadhai full of oil and another full of sugar syrup. Sanjay took a look at these and decided that he wanted jalebis. The mix was ready, but the shop owner did not know how to make them. “Another person comes here and makes them in the morning,” he said. Sanjay decided that he was an expert. We sipped our tea while the stove was lit, and the oil warmed up. 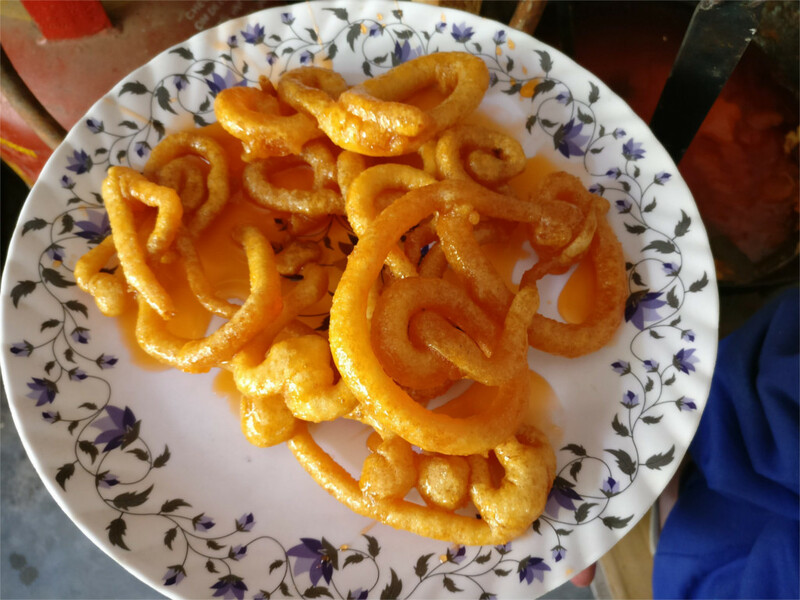 Experimental jalebis were made. The Young Niece started laughing when she saw the plate (photo above). They looked nothing like jalebis, but I notice that she ate them all right. They were crisp and sweet and tasted like jalebis. When we mentioned the Great Himalayan National Park, birders would reflexively say Himalayan Monal. That’s a shy bird we have seen before, always running away startled, and this time was no exception. The slaty-headed parakeet (Psittacula himalayana) was seldom mentioned. It is a spectacularly coloured bird, and you have to climb into the Himalayas to see it, so it has a claim to being the signature bird of the park. The parakeet can be seen across the Himalayas, from Afghanistan to Arunachal Pradesh in the east. We saw raucous groups of these parakeets on our aborted walk from Gushaini to Ropa. In flight, when their wings and tails open up you can see the scarlet patch on the wings, and the blue and yellow tail feathers. The distinctive feature is the slaty head. This individual had a faded slaty colour, but there were others in the group with a darker gray head. This lighter head-colour marks out this bird as a juvenile, meaning it is less than three years old. We saw them towards the end of the breeding season, and perhaps the heavy activity was partly due to the necessity of feeding fledgelings. We saw these birds as we climbed up towards Ropa, on slopes at an altitude of over 2 Kilometers, and saw more them as we climbed. They would descend to lower valleys in winter. Since these are the only parakeets which live at such heights, they are also the only parakeet which are forced to migrate with the seasons. The squaking calls followed as we went back down the path. We must have seen these parakeets before, but I had no memory of it. Nor did our notebooks contain a mention of this birds. So this must have been a lifer. It was the week of the tenth anniversary of my first sight of a russet sparrow when I took the featured photo. I think I’ve seen this bird on all our trips to the Himalayas, from Arunachal in the east to Himachal in the west. I’ve been following common usage to identify it as the Passer rutilans. The first person to publish a description of a bird gets priority in naming it. It seems that there was a forgotten dispute about first description which was originally resolved one way. But new historical research shows that it should have been resolved differently. So, it seems one should refer to this bird as the cinnamon sparrow or Passer cinnamomeus. It is an interesting story. Coenraad Jacob Temminck was the first director of the National Museum of Natural History in Leiden from 1820 until his death in 1858. He inherited a collection of stuffed birds from his father, who was a treasurer of the Dutch East India Company and had strong connections with Asia. He published a description of many birds and animals, including the russet sparrow, to which he gave the name rutilans. The description of the russet sparrow was published in a volume of a book which was dated 1835. John Gould was an expert taxidermist (famous for helping Darwin to identify finches) and the first curator of the museum of the Zoological Society of London from 1827. The Society obtained a collection of birds from the Himalayas. Gould described this lot, including the russet sparrow, which he called the cinnamomeus. The report was published in the Society’s proceedings dated 1835, but it was published on 8th April 1836. Now it turns out that Temminck’s book also appeared some time in 1836, and, since the date is not exactly known, by common convention it must be taken to be 31st of December, 1836. So Temminck is dismissed by a technicality and the sparrow must now be called a cinnamon sparrow. Looking at the photo I wonder now about a detail I had not noticed then: what are the blue flowers in the lower corner of the photo? 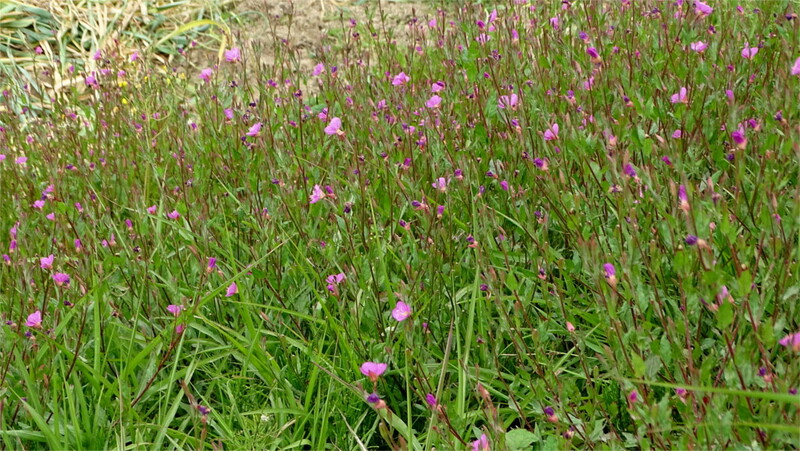 Could it be the rare Himalayan gentian? 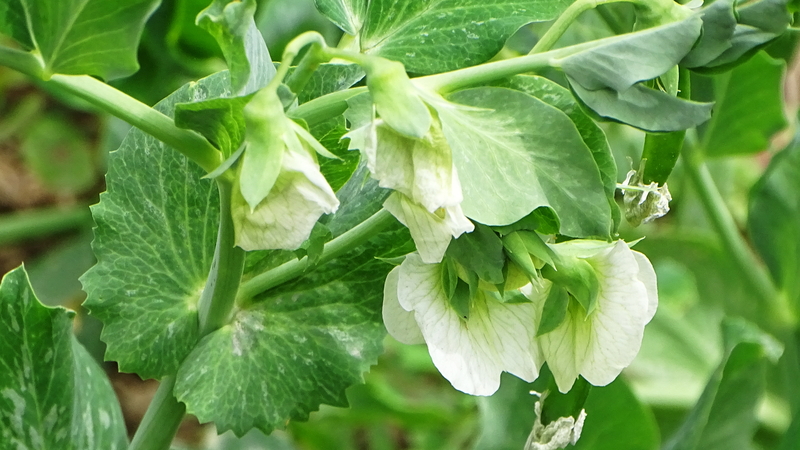 Probably not, because that flowers in the monsoon, and this photo was taken in late spring. 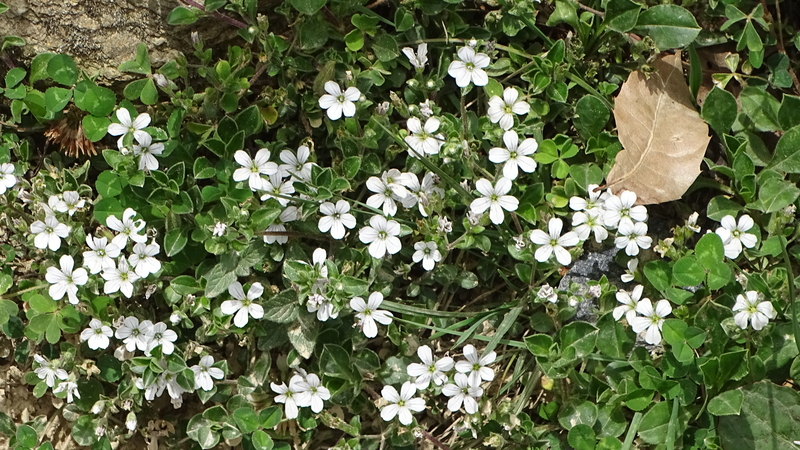 There are not too many tiny blue flowers at an altitude of 2.2 Kilometers above sea level, so this should be easy to place. Unfortunately, I haven’t managed to. Author I. J. KhanewalaPosted on July 2, 2018 July 2, 2018 Categories India, WildlifeTags Himachal Pradesh, Passer cinnamomeus, Passer rutilans, russet sparrow2 Comments on Russet or cinnamon? 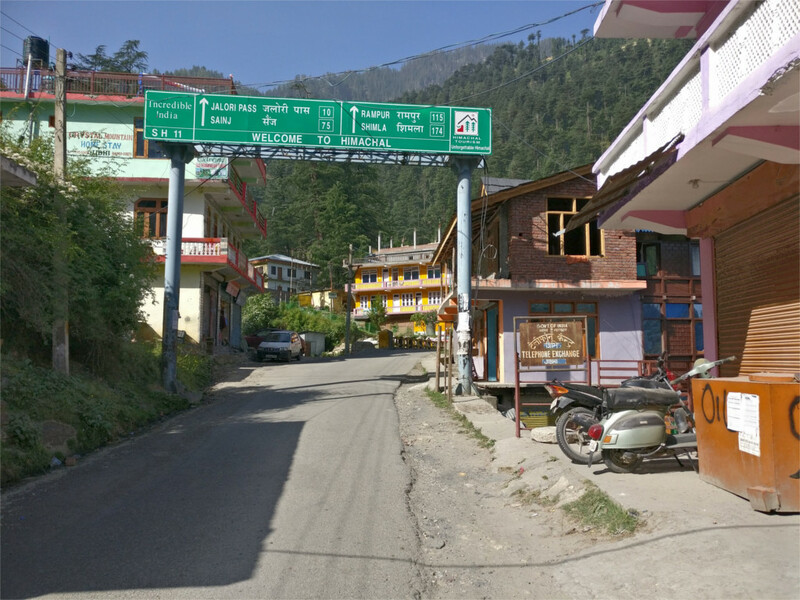 The distance between Jalori pass and Gushaini is not large, but the roads are narrow and hug the mountains above the winding courses of the Tirthan and Banjar rivers. We drove quickly through the town of Banjar. We had a glimpse of shops fronting narrow roads. A few turns, and the road had left the town behind. We wanted to stop for chai, and Soni decided that Shoja is the best place for a morning’s cuppa. Shoja turned out to have all the charm that Gushaini and Banjar don’t. The Young Niece oohed and aahed about the view, so I walked with her a hundred meters along the road to the end of the town and took the featured photo. We’d been seeing these terraced fields near every village, but this was the nicest view of that we’d had. The clumps of chir pine (Pinus roxburghi) and banj oak (Quercus leucotrichophora) salted through the fields, clouds descending from the mountain tops, and the beautiful light were something to enjoy in silence. When we walked back our chai was ready. I gulped down my glassful and wandered up the road to take a few photos of the town. The tailor was already at work at his pedal operated sewing machine. The booth behind him must be the trial room. 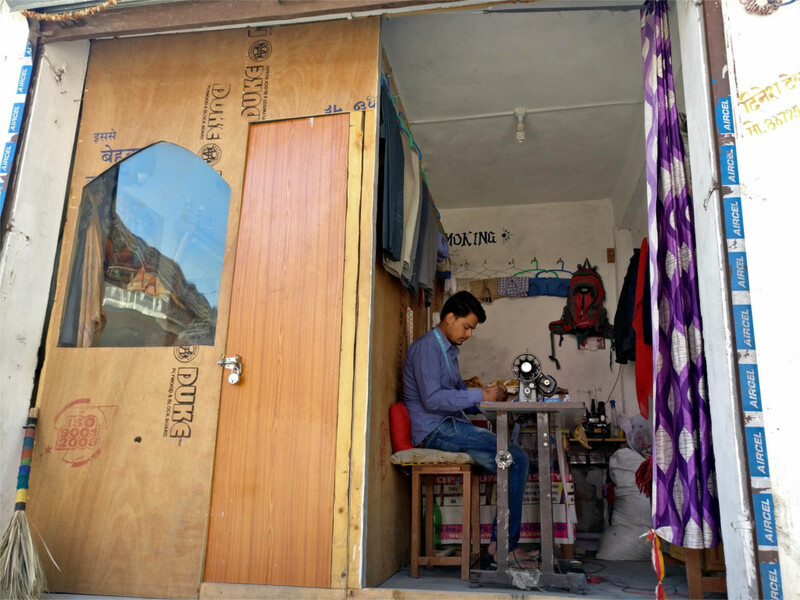 I was surprised that the village is large enough to support a tailor full time. I guess its main earnings are from farms and orchards. Tourism may bring in a little money, since there are possibly some home-stays and a hotel in this village. It looked very clean and more prosperous than Gushaini, but that may just be because it hasn’t grown haphazardly. By now everyone had finished their tea, and we all walked back down the road to take another look at the farms around the village. I got another shot of the slopes and the farmhouses nestled in the fields. There are several interesting small walks around this village, but I had one planned at a higher altitude. We piled back into the car and drove on to Jalori pass.